We’re happy to have added our analytics expertise to the development of the Harbor District’s land use plan. 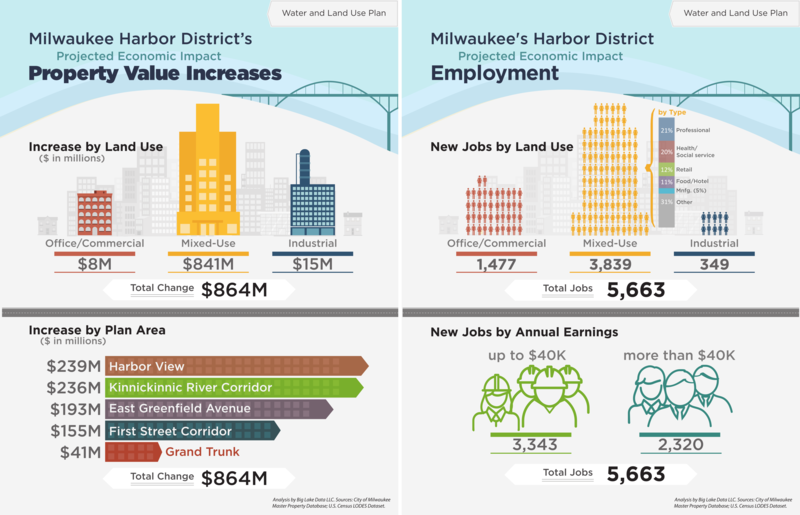 We project that Milwaukee could see more than $860 Million in property value increases and more than 2,300 new, family-supporting jobs. Urban Milwaukee explains what this means for Milwaukee. Interested in learning how spatial analytics can support your work? Drop us a line. Because how many people actually read the report? When the San Francisco County Transportation Agency released its in-depth report on transportation network companies (TNCs), it also launched an interactive data map. Well-designed custom apps, like this one, are excellent ways to engage policy makers and the broader public. Take a moment to explore the TNCs Today map. The map strikes a fine balance between offering the user many ways to interact with the data, while still providing an understandable interface. You can tell that the San Francisco County Transportation Agency put quality work into this – clearly considering the map to be an important piece of its research and policy effort. Nicely done. Interested in learning more about custom data maps and how they can support your work? Drop us a line, we excel at making tools like this. With an infusion of new venture capital, CartoDB has become Carto. They’ve revamped their map builder interface and it’s pretty swift. Without too much effort we were able to map 11 years of Milwaukee crime data, and animate it temporally. Google scoops up Kaggle and it’s AI community. Data storytelling doesn’t get much better than this. Making contributions to the broader analytics community is fun benefit of Big Lake Data’s on-going investment in professional development. As such, we’re honored to have worked with J.A. Marin and Stephan Zohren in the development of an R software package for micro-climate analysis. If you are an R-user, we invite you to view the basic README below and explore the development version of this software yourself. Your feedback is welcomed! wundr provides API interfaces to Personal Weather Station (PWS) data maintained by Weather Underground. Tables of PWS locations and metadata for user specified geographic areas are constructed. Robust retrieval of current and historical weather condition data for selected PWS. Computational tools for spatial analysis, including kriging (Gaussian processes) for interpolation, as well as prediction of missing data and forecasts. Visualization of micro-climate data methods including contextual static maps and interactive web maps. This package was developed as a final project for Prof. Balasubramanian Narasimhan’s Paradigms for Computing with Data class at Stanford University. Creation of S4-Class Table describing a given region’s PWS. Subsettable tables based on #1 above. Robust web retrieval of data and storage in memory. Visualization of micro-climate data through density maps and time-series. Computational tools for spatial analysis, including kriging (Gaussian processes) for interpolation, as well as prediction of missing data and forecasts. Web interface for interactive visuals using leaflet.js. To see examples of these features in use, please view the ‘overview’ vignette. We love it when one of our clients sees big gains from partnering with us. Last week, the Gateway to Milwaukee Business Improvement District was able to counter false perceptions about crime in its area. Using an analysis conducted by Big Lake Data, the Gateway to Milwaukee was instead able to tell a fact-based story about falling crime trends. Learn more about the solution we provided to the Gateway to Milwaukee. Get in touch with Big Lake Data today. We’ll help you make data-driven decisions and tell your story. When Dollars & Sense Magazine hired us to create custom data graphics for its December 2015 cover story, our first task was choosing the right approach. Author Dan Schneider had argued his main point quite clearly in the cover article, “The Worst Place in the U.S. to be Black is Wisconsin,” using supporting evidence from a broad survey of social-economic studies. So, before doing anything else, we needed to determine which class of data graphic would visually drive home the cover story’s thesis. We resisted the inclination to create a visually extravagant graphic with datasets plotted from each source – knowing that it could overwhelm the main point with a sea of disparate statistics. Instead, we sought a design that would emphasize Wisconsin’s miserable standing compared to other states. This seemed like a job for a special class of data visualization: the slopegraph. Then, to clearly show how poorly Wisconsin ranked, we emboldened the lines and type for the three states that came in worst place on any one of the measures (New York, Minnesota, and Wisconsin) and used a spare amount of color to highlight Wisconsin’s particularly sad place among its peers. The trade-off with this design is a loss of information on each measure (what is Wisconsin’s African-American incarceration rate?) for a clear comparison of states across multiple measures. For more on slopegraph variants and design considerations, check out Charlie Park’s fine essay on slopegraph typology. I am pretty sure that the point of the slopegraph is that the slopes are meaningful. That’s why they are often used to connect the same variable measured at two or more time points (across some number of subjects). The slope is the rate of change. In your work for Dollars & Sense, the slopes are not directly or easily interpretable. At best they represent something like consistency across the various rankings. I am sure this kind of plot has a name, but I am not sure what it is. A fair point. As noted, this graph plots the rank order of the states across various measures, not the actual values of the measure for each state. That, plus the fact that the measures are not comparable by time, certainly means that the lines convey much less information than most slopecharts. In fact, what the lines are actually doing here are simply serving as extended labels that connect the rank values of each state across all measures. I could call it a “bumpchart,” which Parker considers a particular subset of slopecharts. But again, it does lack the temporal component. So, maybe I’ll just call it “custom” and leave it at that. In need of a custom data visualization? Let us help. Get in touch. One of the world’s best web mappers runs some colorblind simulations on himself. For those who care about data visualization and user experience, this is a must read. We’re pretty excited about the ongoing development of the custom business intelligence tool pictured above. Combining multiple public data sources with our client’s proprietary data has made the difference in their investment decisions. When making an important decision, its crucial to have all the key information in the same place. Not there yet? Don’t worry, we can help. Get in touch. View all of the posts in the archive, browse the tags, or subscribe to the feed for Trawling - a blog by Big Lake Data.